Fat LossAmix MuscleCore Detonatrol Fat Burner BOX - 90 kaps. Supplement new generation, which is a combination of active substances acting thermogenic, accelerate the burning of calories and fat, and conducive to the development of natural bacterial flora of the gastrointestinal tract. 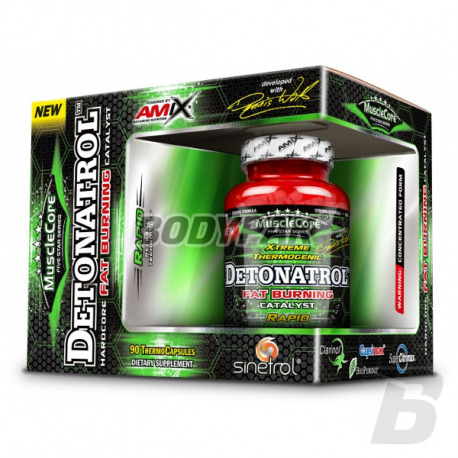 Amix MuscleCore Detonatrol Fat Burner BOX - 90 kaps. If you think the product is not pre-workout will help you burn excess fat - you're wrong, thanks to this product are able to reach for both objectives. Perfect for pre-workout and as a fat burner. 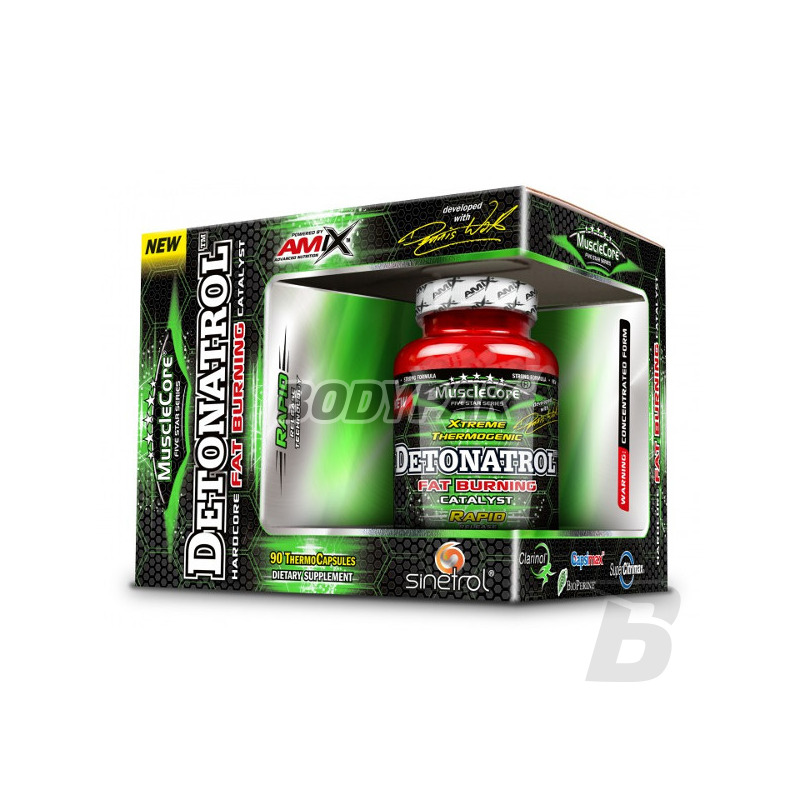 MuscleCore® DetonatrolTM is an exceptional thermogenic fat burner and explosive performance stimulant exclusively engineered in LargeLife laboratories in cooperation with AmixTM Team athletes. AmixTM DetonatrolTM combines only the highest quality, maximum strength and extensively studied ingredients such as Sinetrol®, Clarinol®, Super CitriMax®, AstraGinTM, BioPerine® and many other effective compounds in a unique and easy to use formula. MuscleCore® DetonatrolTM is perfect to use as a pre-workout energy booster and to promote weight loss! – contributes to maintain normal function of joints & muscles and to invigoration of the body. Take 2-3 capsules two times daily approx. 30-60 minutes before physical performance. Wash down with plenty of water. Warning: Limit the use of caffeine-containing medications, foods, or beverages while taking this product. Ingredients: SINETROL® XPUR [The extract was orange (Citrus aurantium var. Dulcis) extract, grapefruit (citrus grandis) extract, red orange (Citrus sinensis Osbeck L), guarana seeds (Paulinia cupana L.)] gelatin capsule ( pure gelatin, water, titanium dioxide), raspberry ketone, anhydrous caffeine, an extract of green coffee seeds, Clarinol® CLA (conjugated linoleic acid), garcinia cambogia extract SuperCitriMax (50% HCA), White Willow Bark - an extract of Rhodiola Rosea. Bacopa monnieri, ginger root extract, green tea extract, ascorbic acid, niacin, ursolic acid (rosemary leaf extract), pyridoxine HCl, Banaba - leaf extract, Capsimax® (capsicum fruit), Bioperine®, anti-caking agents: silicon dioxide magnesium stearate. Dzięki temu, diecie i ćwiczeniom schudłem w ciągu roku kilkanaście kilogramów. Wiem, że niektórzy zdziałali więcej, ale i tak cieszę się, że choć trochę zmieniłem styl życia ;) polecam. Świetnie działa, czuć pompę.. i generalnie jakby lepsza definicja mięśni. High quality L-carnitine in the form of ampoules, the content of which is ready for consumption shortly after opening. High comfort supplementation! Each aliquot is up to 3000mg of L-carnitine! Support your body in the best weight loss supplement! Advanced formulation based on l-carnitine and green tea extract. Ideal choice for people who are slimming and caring for proper weight. It supports the process of fat loss and supports the immune system in the fight against free radicals! Highest quality at a good price! Trec L-Carnitine PRO - 120 kaps.